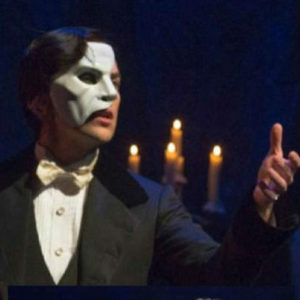 Chris Mann will appear at the Wayne Theatre with his “A Night with The Phantom” show on Friday, January 13, 2017, at 8 p.m.
Mann is hailed by critics as “the best phantom since Michael Crawford!” After 700 performances in Cameron Mackintosh’s spectacular new production of “The Phantom of the Opera,” Mann is inviting audiences to spend “A Night with the Phantom” to celebrate Broadway’s greater hits. Tickets prices range from $40 for admission to $150 for the full VIP Treatment. Mann rose to fame as Christina Aguilera’s finalist on NBC’s “The Voice.” Since then, his albums “Roads” and “Constellation” have topped the Billboard charts and he started in two of his own PBS television specials. Chris has performed with the National Symphony for President Obama, at Christmas in Rockefeller Center and headlined his own symphony tour where his golden voice and hilarious stage stories dazzled audiences across the country. He has performed on TV shows included Ellen, The Today Show & The TonightShow with Jay Leno and was an original member of The Warblers on the hit TV show, Glee.